Caring for your Bones – No Calcium or Exercise Required! In our modern, health-conscious society, just about everyone knows that properly caring for one’s own bones involves adequate ingestion of certain nutrients (calcium, vitamin D, vitamin K) and maintaining bone mineral density through exercise – or so the common wisdom goes, anyway. What about caring for someone else’s bones, however? When that “someone else” turns out to be vertebrate animals whose bones have wound up in a museum collection, the answer involves neither mineral supplements nor resistance training exercises, although saliva might come into the picture (more about this below)! 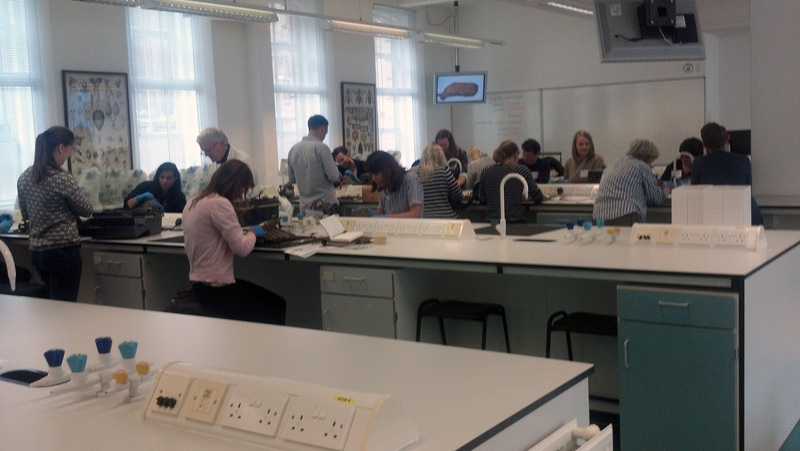 I learned all about the basics of curating an osteological collection at the NatSCA event entitled ‘Bone Collections: Using, Conserving and Understanding Osteology in Museums’, held at the University Museum of Zoology in Cambridge on September 8, 2015. The day involved a workshop focused on cleaning bone specimens, talks touching on osteology from both biological and museological perspectives, and a series of posters presenting various case studies concerning the treatment of skeletal material (ranging in nature from modern to sub-fossil and fossil) that required cleaning and repair. At the Canadian Museum of Nature (CMN), where I am employed as a research assistant and collections manager, we have an extensive osteological collection that was established through the collaboration of the museum’s vertebrate zoology staff and the researchers who operated the now defunct Zooarchaeology Identification Centre (ZIC). Use of our osteological comparative material has declined greatly since ZIC ceased to operate in 1996, and relatively few zooarchaeologists working in Canada are aware of our holdings, which is a shame as the osteology collection represents a great national resource that would benefit archaeological research in the country. I am setting out to change this situation. Having a research background in zooarchaeology – something I have in common with Kathlyn Stewart, head of the CMN Palaeobiology Section – I would love to see the rebirth of an active zooarchaeology programme at the museum. Kathy and I are joining forces to foster growth of the osteology collection in several directions, including expanding the number of specimens to include taxa that are currently underrepresented, increasing knowledge of the collection as a comparative research tool in the archaeological community, and developing CMN-based zooarchaeological research projects. The Bone Day in Cambridge was therefore the perfect opportunity for me to gain hands-on experience in the care and maintenance of osteological collections. I spent many years working with osteological collections as a research aid, but I have had little experience in curating such collections. Supported in part through a generous NatSCA bursary, I was able to attend the workshop and conference, affording me the occasion to investigate several topics in greater depth with osteology experts and fellow museum workers. Most important for my goals was learning about techniques for the care of bone and the preparation of skeletal specimens from carcasses. 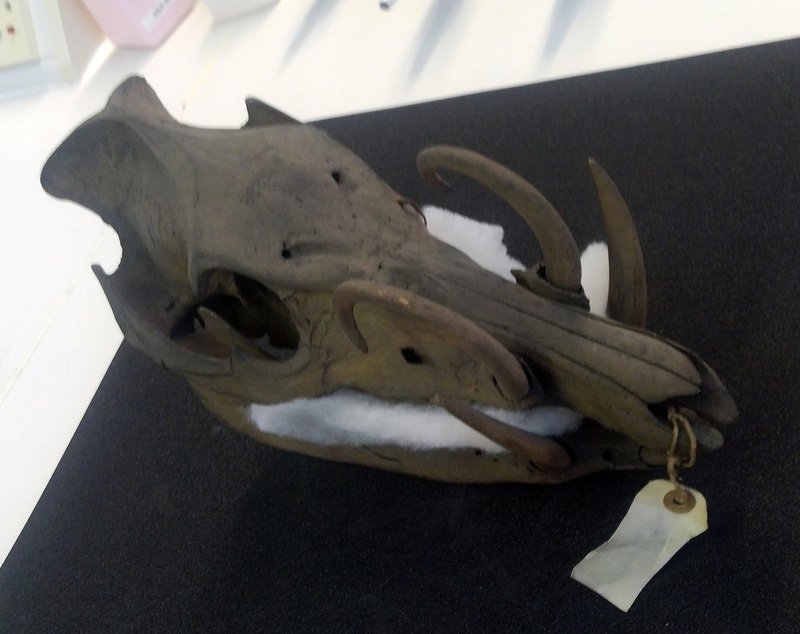 The skull of a babirusa, and Indonesian wild pig, used in the workshop to test cleaning methods. 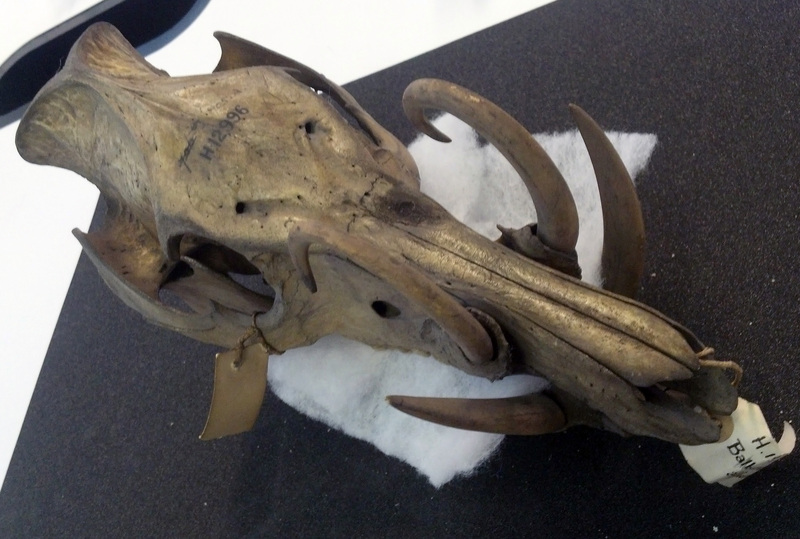 The babirusa skull after a cursory cleaning using brushes, smoke sponge, swabs dipped in Synperonic A7, and yes, even some spit. The day began for me with the morning bone cleaning workshop, where we were introduced to some of the safest and most effective ways of removing deposits that accumulate on the surface of bone specimens, ranging from dust and dirt to bone grease and adipocere (a waxy substance that develops from fats such as bone grease under certain conditions). Gentle brushing and vacuuming, combined with the use of products such as smoke sponge and Groom/Stick natural rubber, remove a significant amount of particulate matter from the surface of bone. For stubborn accumulations, especially those involving bone grease, ethanol solutions and surfactants such as Synperonic A7 (an alcohol ethoxylate) work wonders. Surprisingly, saliva is also an effective cleaning agent, the enzymes in human spit serving quite well to loosen up agglomerations of dust and oil! The afternoon talks, which included an overview of the importance of osteological collections for archaeological work as well as a discussion concerning an enzyme-based method for skeletonising carcasses, were particularly relevant for me with regard to resurrecting zooarcheological research at the CMN. I believe that several of the presenters from the conference’s slate of lecturers, as well as the leaders of the workshops, are considering submitting blog posts about their contributions to the osteology event, so I will refrain from providing any additional details here. Rather, I will encourage you to stay tuned for future entries concerning the care of bone. I learned a great deal during the NatSCA Bone Day and made several fruitful contacts with NatSCA members, making it well worth the time and effort of “crossing the pond” from Canada to the UK. I certainly look forward to continuing my association with NatSCA into the future. Many thanks to the organisation for sponsoring the osteology event and kindly providing support for my attendance, and I hope that I will be able to work with NatSCA to hold a similar ‘bone day’ here in North America sometime soon—I know it would be well received!